Think of shrubs as transitional plants that provide a bridge between the scale of large elements (houses, barns, ponds) and the smaller dimensions of gardens, or even individual plants. They offer many ornamental qualities, including flowers, foliage, fruit, and bark, and can be used effectively in ways that range from the passive evergreen border to the joyous crescendo of an Azalea border in May. Shrubs are most effective when used so as to accentuate their intermediate scale while showing off their virtues. This means that the first rule of shrub selection is to anticipate the mature dimensions of the variety you have selected, and position it accordingly. While it is possible to manage the size of a shrub through pruning, the result is seldom as satisfactory as its natural form. Accordingly, it may make sense to plant multiple specimens, anticipating that some plants will be removed as their size increases. With few exceptions, shrubs prefer to be planted in moderately rich, well-drained soil in a site that provides at least a half day of sun. Once they are properly planted, their care is generally minimal. Flowering varieties will typically produce more bloom if they’re deadheaded (removing spent flowers before they set seed, which also eliminates fruit formation), and many varieties will profit from regular pruning that complements their natural habit by removing unbalanced, awkward, or weak growth. The timing of pruning should be planned to enhance bloom. Early-blooming varieties should be pruned immediately after flowering, while late bloomers want attention in late winter. Caution and common sense are the key guides in pruning. Before planting, check the potting mix in the pot and water thoroughly if it’s dry. Dig a hole slightly larger than the pot. For pot-grown woody plants that are to be planted in unimproved soil, dig a hole 3–5 times the diameter of the root ball but no deeper than the height of the root ball. Remove the plant from the pot by grasping the rim, turning the pot upside down, and tapping it against the heel of your hand. 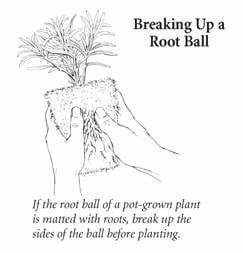 If the plant is root-bound (the root ball matted with roots to the point that they obscure the potting mix), gently break up the sides of the ball with your thumbs and tease apart roots that are circling at the bottom. This encourages roots to grow into the surrounding soil. 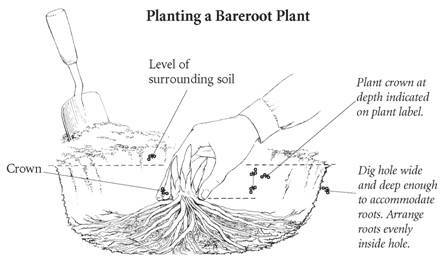 Set the root ball in the hole so that the top of the ball is level with the surface of the soil. Then push soil around and just over the top of the root ball and firm the soil by pressing down with both hands. Make a rim of soil around the edge of the planting hole to form a basin, which will hold water and channel it to the roots. Finally, fill the basin with water several times. Unwrap the shrub just before you’re ready to plant and discard the packing material. Soak the roots for a few hours. The roots of many woody plants are brittle, so take care not to break them. Dig a hole wide enough to accommodate the spread of the roots and deep enough to allow you to set the crown—the point where the leaves or stems of the plant meets the roots—1in below the surface of the soil. (Some plants require deeper planting, other shallower planting—see the White Flower Farm plant label.) Place the roots in the planting hole and arrange them in whatever fashion appears natural. Holding the crown of the plant, push soil into the hole, working soil around the roots. After planting, make a rim of soil around the edge of the planting hole to form a basin that will catch water and channel it to the roots. Unwrap the vine just before you’re ready to plant. Soak the roots for a few hours. The roots of many woody plants are brittle, so take care not to break them. Dig a hole wide enough to accommodate the spread of the roots and deep enough to allow you to set the crown—the point where the leaves or stems of the plant meets the roots—1in below the surface of the soil. (Some plants require deeper planting, other shallower planting—see the White Flower Farm plant label.) Place the roots in the planting hole and arrange them in whatever fashion appears natural. Holding the crown of the plant, push soil into the hole, working soil around the roots. After planting, make a rim of soil around the edge of the planting hole to form a basin that will catch water and channel it to the roots.